It will be here soon and everyone is getting ready! Tons of pottery is being made--handbuilt, wheel-thrown, sculpted, carved, decorated, glazed with beautiful colors and fired in a myriad of kilns across the region. Wood fired, gas fired, soda fired, fired in oxidation, pit fired, raku fired....we're just a bunch of firing-like-mad folks!! 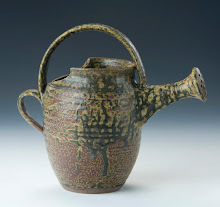 Tune into the Facebook page to see examples of work--we're trying to feature about 6 potters a week. Also, see what else there is to do in Shelby and surrounding areas. 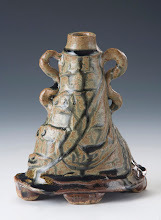 Make it a weekend out when you visit the 2015 Carolina Pottery Festival. Check out the Facebook page as we will be running some cool contests with great prizes in the weeks before the Festival. 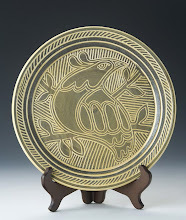 This piece is by Tim Moran, Celtic Pottery. It's in the works. The plans are being made. Will you be there? 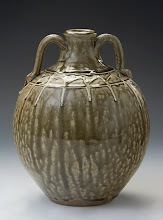 One of the largest, indoor, pottery-only festivals in the Carolinas! 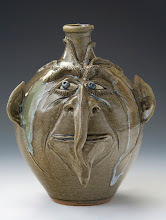 The 2013 Carolina Pottery Festival will be moving to the LeGrand Center at 1800 E. Marion St. in Shelby, NC for the Nov. 16th, 2013 Festival. We're excited about the new venue where everything will be indoors and in the same area, with lots of space for the pottery loving crowds to find their favorite potters. So, mark your calendars!! We are so excited about this location. After searching many locations for a large enough venue to accomodate all the potters attending the 2012 Festival, we were able to come up with space at the Cleveland Mall. This is a beautiful location with plenty of parking, convenient to 2 hotels and numerous restaurants inside the Mall and on the Mall property. This gives us the space we need for all our potters and an indoor venue! Our thanks go out to the Mall, and the stores at the Mall that were able to provide us with the room we needed. Normally there is a $3.00 admission fee for the Festival which goes toward the advertising and printing costs and a portion of it also benefits the Cleveland Co. Arts Council for help with all of their great programs. In lieu of the admission fee, we will be asking for donations from the public and there will probably be some other sort of exciting event like a pottery raffle to help offset the loss of these funds. Please forward this to all your friends so we can let everyone know where we will be on Nov. 10th. And you can share this post on your Facebook page by choosing MORE on the top menu of the blog and then logging in to your Facebook ! There will be a change of location for the Carolina Pottery Festival this year. However the date, Nov. 10th, and times are the same. The Board of Directors is working on finalizing the location change details and it will be posted here and on the Facebook page. Please check back in a day or so! Yes, it's a little ways away, but always good to know the date, so you can save it! Linda Dalton's (from West End, NC) beautiful pot just shines on these billboards that went up around Gastonia, Mt. Holly and Belmont. 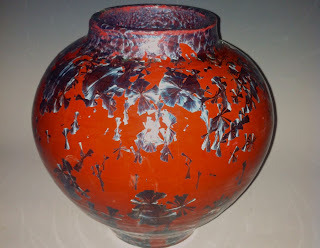 For information about the Festival or media coverage, please contact bluegillpottery@bellsouth.net. 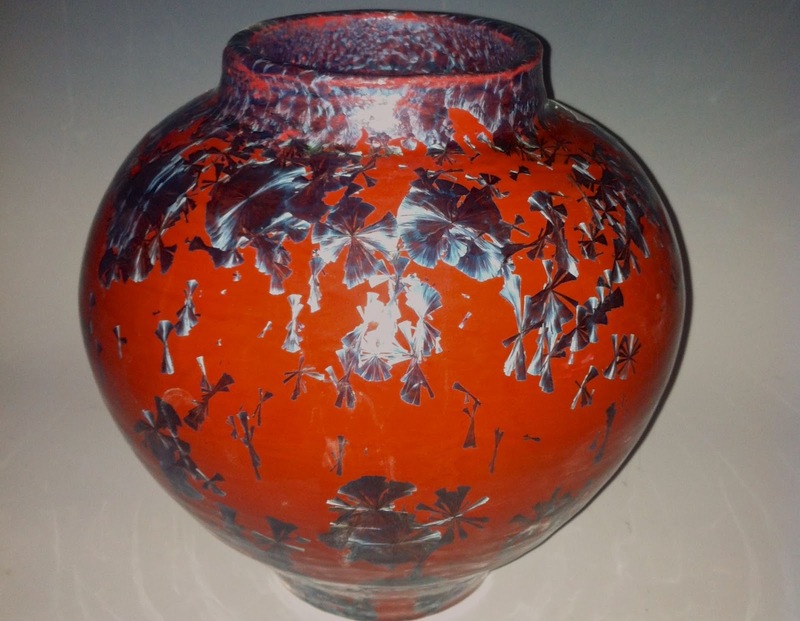 The Carolina Pottery Festival has become one of the largest, pottery-only indoor festivals in the southeast. 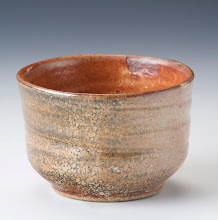 Over 100 potters will be showing and selling their work on the second Saturday in November.